Catching turtles easily and effectively. Turtles are generally harmless creatures, and have a calming demeanor about them and usually are a welcome addition to any landscape. But, with over 200 species of turtles in the world today and at least one species on each continent (excluding Antartica), there are some occasions when turtles become pests. They generally invite themselves into pond areas with vegetation or fish to feed on and will stay there until the food source runs out or until you relocate them yourself. There are many effective traps to use when trying to rid your pond, lake, or area of turtles. It is important that you decide what your situation is - in order to decide what type of trap you will need. It is also always very important that the trapped turtle is relocated or it will return to your area and continue to destroy whatever it is that you are trying to keep it from. It is ideal that the turtle is to be dropped off at least 5 miles from the area where you trapped it so that it does not find its way back. Also, make sure there is a natural food supply and comfortable environment wherever you chose to relocate the turtles. Because many turtles feed not only on vegetation, but also on fish or other meat products, they become a problem to fish farmers who rely on the fish in their ponds or lakes to bring in income when sold. If these turtles are getting into the fish farmer's ponds and lakes and feeding on their fish then the turtles are also eating into the farmers profit because he doesn't have as many fish to sell that season. These traps are especially good for catching Snapping Turtles and other water type turtles that do not always like to sun themselves or are not very susceptable to being trapped with the sundeck turtle trap. 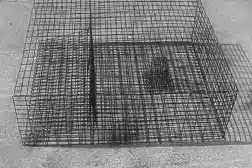 The hoop net can be set below the surface to drown quarry or partially submerged to keep turtles alive and fresh for relocation. This turtle trap requires a little more work when setting the trap and removing the turtles. The poles must be driven into the mud because these traps are required to be stretched between them to give the trap it's shape. This trap will need to be removed from water to extract the turtles but this may be the only way to remove the really large Loggerheads. 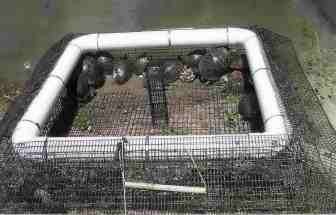 This turtle trap is really effective with snapping turtles and other water type turtles. It floats so it keeps the turtles alive and fresh. Some snapping turtles may not want to sun themselves on the sundeck turtle trap so this is a surefire way of catching those water type turtles. 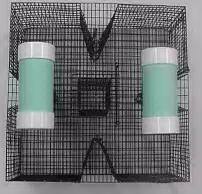 It is much easier to use because there is less work involved in setting the trap and in removing the turtles than there is with the hoop net. Simply attach this trap to strings on both ends of the pond and pull it in when you need to remove the turtles. The turtle tunnel will also catch fish with the right bait but be sure to check your local game and fish regulations! Since most turtles like to lay out on logs, rocks, or other flat, above water line objects, the sundeck trap should be considered. It basically offers a resting place for turtles that like to lay out and absorb the sun. Turtles can easily access the trap via the inclined ramps located on either side. No bait is needed. This ramp is entered by ramps on either side which will allow targeted turtles to climb above the water line. Once up the ramp they will have passed over the round floating rim which will then serve as a barrier preventing them from getting away. Turtles that move out over the trigger board will invariably fall into the holding net section which keeps them alive yet confined. A similar but larger trap is the solarium turtle trap. This turtle trap works by attracting turtles in much the same was as the sundeck turtle trap. However, it is much more sturdy, traps turtles faster since it uses 4 clamped entrance ramps insuring longer life and more durability. Get this turtle trap for larger problems where you have a lot of turtles to trap or if you anticipate an ongoing problem. 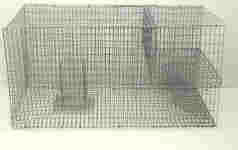 A similar but smaller trap is the sundeck turtle trap. SINKING TURTLE TRAP This trap is one of the earliest turtle trap designs. It is very effective for snapping turtles and is often used to drown them so removing them will not be hazardous. 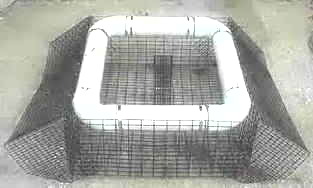 COMBINATION SNAKE AND TURTLE TRAP This Trap is designed to keep dangerous varmints out of your fish or koi pond. It is smaller than the traps above so that it is not obtrusive. It can easily be hidden by foliage or rocks and will control pests that can harm your garden pond. Made of 1/2" x 1" vinyl coated wire with floats for water snakes like the Cottonmouth Water Moccasin - 23" x 23" x 11" size for large snakes Has 4 entrances... so no misses! Use frogs or fish for bait - will drown snakes for safe handling with current configuration. Floats can be mounted on sides to keep snakes alive. (Not recommended!) Anchor in shallow side of the pond with twine.